Michael in NYC during last week's Frank promotion. Michael Fassbender's newest film, 'Frank', opens in very, very select theaters in the US today, and then over the next month, it slowly rolls out over the country to other very select theaters. Unfortunately, it's only going to screen at a rinky dink theater in Grand Rapids, MI, a lame city 150 miles from where I live. I'm hopeful that this flimsy list is totally incomplete and that it will screen in Southeast Michigan soon like in Ann Arbor, Royal Oak, Detroit or Birmingham! This totally messes up me and Snootiegirl's plans to see it together. Although I already saw the movie in June in LA (read my review), I want to see it again, it's that good! 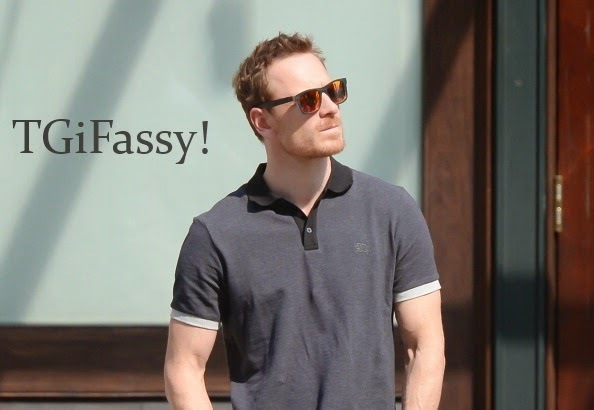 Seeing the fun that Michael Fassbender had in the past week in promoting the film and his interview responses about the film have made me itchy to watch Frank again. So I encourage you to see it if it's going to play near you! I'm very dissapointed, this film looks really excellent, I'd like to see it in a movie theater. It's discouraging how this small independent film with a major star that we idolize, is getting such ill treatment in its distribution. I know I complain about it not being screened in my state in a more convenient location - after already seeing it. But for those who simply will have NO chance seeing it on the big screen, it's really rude. This is definitely a movie to be seen in the theater, especially because of the music. To me it's actually puzzling. The film has way more potential than some of the locally and internationally produced movies, and yet it is not screened all over the place. This is really wierd. Who knows what the deal is. I will be watching for sure. Maybe a few times at least. And of course my family and friends know of this movie. I will of course be encouraging them all to see it. Hopefully it will open near me in the next few weeks. It is weird that it's receiving little play. Even near me it's not opening this weekend. I live near a major city so it was weird that it's not opening this weekend in select theaters.